Many people say that Jeff Edstrom puts them to sleep. They even say that they fall fast asleep while he is talking to them! Believe it or not, Jeff is proud of this. education and it is rewarding for him to be able to relieve people’s pain using his skills in anesthesia. 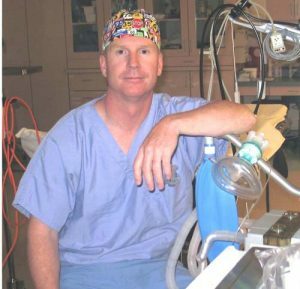 Jeff Edstrom was working in Wisconsin, when he met Dr. Blaine Ruby. Dr. Ruby, a Buffalo native, came back to JCHC to begin his surgical practice, and talked Jeff into checking Buffalo out. Jeff and his family had no plans of leaving Wisconsin, but because of their strong religious beliefs, they felt that Buffalo is where the Lord wanted them. And they haven’t been disappointed. Finding an opportunity in Buffalo to work with the dedicated staff, becoming part of a thriving community and being near the mountains again added to their list of positive reasons to move. The school system was also a draw. “The kids aren’t just a number in a huge school system anymore. They thank us for moving to Buffalo. We are thankful that the kids had the opportunity to really shine here,” Jeff says. Jeff was raised in Rexburg Idaho, and is married to Becca, who is from Wisconsin. They have 4 children. Jeff likes to work with his hands – he works on cars, does carpentry, rides horses, uses heavy equipment and enjoys riding 2 and 4 wheeled vehicles. JUST WHAT IS A CRNA? Certified Registered Nurse Anesthetists (CRNAs) provide anesthesia in collaboration with surgeons and Medical Doctors at JCHC. Numerous outcomes studies have demonstrated that there is no difference in the quality of care provided by CRNAs and their physician counterparts. Certified registered nurse anesthetists (CRNAs) play a crucial role in the success of a variety of medical procedures. They work in collaboration with surgeons, anesthesiologists, dentists, podiatrists, and other professionals to ensure the safe administration of anesthesia. Some of their responsibilities include providing pain management, assisting with stabilization services, and overseeing patient recovery. These services may be used through all phases of surgery and for diagnostic, obstetrical, and therapeutic procedures as well. Due to their advanced training and the weight of their responsibilities, nurse anesthetists are generally well-compensated professionals. The American Association of Nurse Anesthetists (AANA) reports that nurse anesthetists first arose during the Civil War to give anesthesia to wounded soldiers. These days, CRNAs are the main providers of anesthesia in rural and medically underserved regions of the U.S., although those aren’t the only places where they work. Nurse anesthetists are also the main providers of anesthesia to men and women in the U.S. Armed Forces, and can work in a variety of settings. These healthcare professionals must have at least a master’s degree and can practice relatively autonomously.